We had our first 8 foot Bible Map chart hand painted in 1969 and used it for many years in preaching and teaching ministries. Since 1969, we've had hundreds of these large 8 foot charts produced for others to use in churches, evangelism, home missions and on foreign missions fields. They're sharply and beautifully produced on VINYL material with grommets top and sides. To buy or build a portable stand for these large charts, Google "Backdrop Stands." 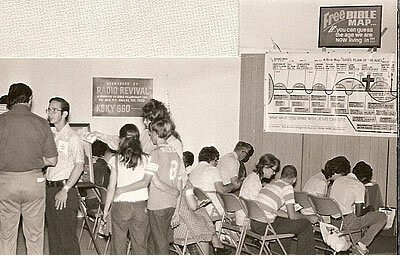 Since 1970, these charts have been used in Fair Booths with thousands led to Christ one-on-one. Bonus Items Included: The "Free Bible Map Poster" which is very effective with the chart. A large Rapture Picture (22 x 28 inch print) for witnessing to people in these booths. A "Fair Evangelism Training Kit" with the "The Divine Encounter" 80 page manual which details this method of evangelism used by many churches for many years, a Bible Map Audio CD and a DVD Video. 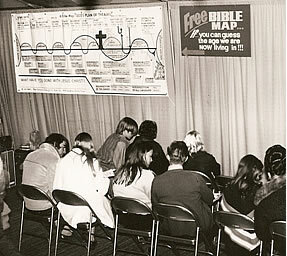 In 1969, our first hand-painted 8 foot Bible Map chart was $250. By getting these large Bible Map charts produced in quantities, we can provide them at only $150 each, including the bonus items shown above.